Going vegan is very fashionable these days but is it good for your health? I take a look at the pros and cons. Vegans only eat food from plants. We should all be eating a more “plant-based” diet, organising our meals around whole grains, pulses, vegetables, fruits, nuts and seeds. Diets that include plenty of these foods have been shown to be associated with a lower risk of heart disease, raised blood pressure, stroke, cancer and diabetes. 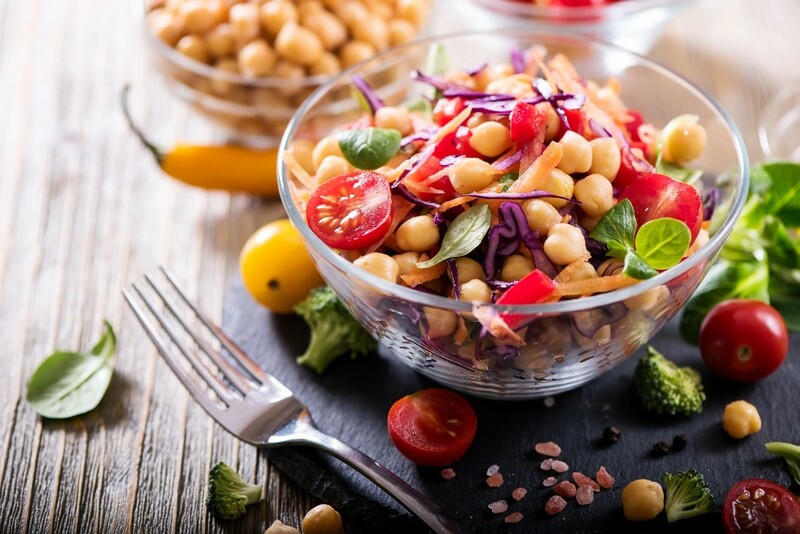 Vegan diets are high in fibre and usually include a good mix of both soluble and insoluble fibre. Insoluble fibre comes from wholegrain foods, vegetables, potato skins, nuts and seeds. This type of fibre helps waste pass more quickly through the gut, which keeps our bowels healthy and reduces our risk of serious bowel diseases such as cancer. Studies have shown that insoluble fibre and wholegrain cereals in particular also reduce our risk of heart disease and stroke. So unsweetened, wholegrain breakfast cereals, brown rice and wholemeal pasta would be good choices. The research studies showing benefits of wholegrains tended to look at commonly eaten grains so we don’t know as much about pseudo-grains like quinoa and amaranth. However these are both highly nutritious and certainly worth including if you are a bit more adventurous. Healthy vegans tend to be adventurous and include a really wide variety of foods. Soluble fibre comes from oats, rye, barley, buckwheat, fruits, root vegetables like carrots and potatoes, beans and pulses like kidney beans, chick peas and baked beans. This type of fibre helps soften our stools making them easier to pass, reducing our risk of bowel disease. Studies have also shown that soluble fibre and oats in particular may help reduce blood pressure and lower cholesterol. Make sure you are avoiding the instant type of oats which often have lots of sugar added. There is increasing evidence that the by-products of the fermentation of dietary fibre by the bugs that live in our gut may have a positive impact on our health. These by-products include short-chain fatty acids (SCFAs), which make the colon more acidic. This prevents the growth of some harmful bacteria. Furthermore SCFAs bind to receptors in tissues all over the body including immune cells and fat cells. Consequently there may be wider beneficial metabolic effects in relation to things like reducing insulin resistance, preventing weight gain and improving immune function. Much more research is needed to find out how much and what type of change in microbial populations is needed to bring about improvements in health. However it is a really exciting area and one to watch. Vegan diets are bulky and filling and so it’s harder to eat too much. This means it can be easier for vegans to lose weight and keep their weight in the healthy range. Given that around 27% of the UK population is obese it’s an important consideration. If you are vegan you might be lacking in calcium because you avoid dairy products, which are usually the main source of calcium in our diets. If your reason for avoiding dairy foods is ethical then that’s a personal choice. However it’s important to say that there are a lot of scare stories in the press and on the internet about dairy foods, hormones and antibiotics. Hormones are used in some countries to stimulate higher milk yields, but this is not allowed in the EU/UK. Hormones may be prescribed for individual cows for reproductive issues or antibiotics for disease but use of veterinary medicines is very carefully controlled by law and when they are used the cow’s milk is not allowed to enter the food chain for a stipulated period, known as the withdrawal period. If you still want to go vegan rather than vegetarian and avoid dairy foods then be sure to include calcium fortified soya products like soya milk and yogurt along with dark green leafy vegetables, calcium set tofu, sesame seeds and dried fruit. It’s hard to get enough iron from a vegan diet. Iron helps make red blood cells, which transport oxygen around the body and assists with energy production. That’s why people with iron deficiency feel tired and lethargic. There is much more iron in meat than there is any any vegetarian or vegan food and it’s easier for our bodies to use the iron from meat, poultry, fish and offal (haem iron) than from other sources (non-haem.) For this reason the iron requirement for vegetarians and vegans is set at a higher level than for meat and fish eaters. If you are vegan it’s essential to include lots of pulses, dark green leafy vegetables, iron fortified wholemeal bread and dried fruit. The absorption of non-heam iron is increased when vitamin C-rich foods are eaten at the same time. These foods include citrus fruits and juices, strawberries, kiwi fruit, pawpaw and melons, as well as green leafy vegetables, tomatoes, broccoli, and peppers. Phytic acid (present in wholegrains and legumes) and tannins (found in tea and coffee), reduce iron absorption. This is why you should avoid consuming tea and coffee with meals. Calcium also inhibits iron absorption. If you take a calcium supplement, take it between meals. Calcium citrate is best because calcium carbonate needs stomach acid which is produced when you eat for good calcium absorption. Don’t cut back on wholegrains and legumes though as you need these for other nutrients. Just make sure you also include vitamin c rich foods to counter-balance the effects. Vitamin D is something we all struggle to get enough of and because the best sources are oily fish, liver and egg yolks it’s even harder for vegans. Look out for fortified orange juice, soya products, margarines and cereals. However this is one of those rare occasions where I also recommend a supplement. You should take 10ug/day. Oily fish are also a great source of omega 3 fats but can vegans find omega 3 in vegetable sources? We know that people from countries where their diet is rich in omega 3 fats have a lower risk of heart disease than we do in the UK and that omega 3 fats help reduce inflammation in the body. There is also some evidence, albeit weaker, that omega 3 may help with memory and the prevention and treatment of depression so it is an important nutrient. ALA or (alpha-linolenic acid) is a type of omega 3 fat found in vegetable oils, seeds such as chia seeds and linseed (flaxseed), nuts such as walnuts, pecans and hazelnuts and green leafy vegetables. It cannot be made in the body and must be obtained from the diet. However there is less evidence that ALA is protective in relation to heart disease than there is for the omega 3 fats found in oily fish. These “fishy” omega 3’s are called EPA (eicosapentanoic acid ) and DHA (docosahexanoic acid.) Although our bodies can make EPA and DHA from ALA, the conversion rate is slow and only small amounts of EPA and DHA are made and so it is recommended that we include sources of EPA and DHA in other words oily fish, in the diet. So if you’re vegan you may wish to consider taking a supplement containing EPA and DHA obtained from plant sources. Amino acids are the building blocks of protein. There are 20 amino acids that we need for growth and the renewal and repair of cells and tissues. 9 of these are described as essential because our bodies cannot make them from other amino acids. This means that we must get them from the diet. There are more animal foods than plant foods that contain all the essential amino acids in the proportions that we need for health. However it’s perfectly possible to get all the essential amino acids from a vegan diet. Including a variety of pulses (beans, lentils and peas), cereals (wheat, rye, barley, oats, corn, millet), other grains (quinoa, amaranth, buckwheat), nuts and seeds will give you a healthy balance of essential amino acids. For those at risk of developing an eating disorder veganism can be dangerous. Websites that promote anorexia sometimes recommend a vegan diet as a way of avoiding food. This is because it offers a seemingly reasonable excuse to reject food and in particular to turn down fat and calories. Furthermore people with an unhealthy obsession with healthy eating where they literally fear some foods that they consider unhealthy sometimes use veganism as a way of rationalising their fear. If you know someone who suffers from these fears or who is using veganism in an unhealthy way there is some excellent advice about what to do at this NHS link. The key take home message is that whilst eating a more plant-based diet is certainly a healthy choice you do not need to go vegan to get these benefits. If you do want to follow a vegan diet for ethical reasons then remember that variety if the spice of life. You need to eat a really wide range of foods to give your body the best chance of getting what it needs. A vegan diet can be healthy and balanced but you need to plan your meals carefully. This entry was posted in Balanced diet, Vegan and tagged vegan by Stephanie.fade. Bookmark the permalink.